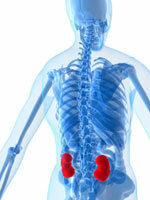 Diabetes is the leading cause of kidney failure in the U.S. Type 2 diabetes is the most common type of diabetes by far—making up more than 90% of the 24 million cases in the U.S. Experts use words like "epidemic" and "worldwide crisis" when they talk about it: Millions of people have it and a staggering number are expected to get it (300 million worldwide by 2025, according to one study). Diabetes doesn't get the attention of, say, cancer or scary viruses. One reason might be because type 2 diabetes is so incredibly common—about 20% of people over age 60 get it. A large chunk of the population just seems to have the genetic programming to develop the disease with age. However, diabetes is also on the rise because our modern lifestyle—lots of food and little exercise—speeds up the process. So people who might have developed this "old-age disease" in their 60s and 70s are now developing the disease much earlier due to obesity and lack of exercise; sometimes in their teens or in childhood. One in three children born in the U.S. in 2000 will develop diabetes at some point in their life (including more than half of Hispanic females), according to a Centers for Disease Control and Prevention study published in 2003. But not all is gloom and doom. If you have diabetes, you have a lot more control over the disease now than just about any other point in history. And if you have prediabetes, you have a good chance of preventing or delaying the disease by making lifestyle changes or taking medication.